Dune Smuggler is a rare Agility creature card. It is part of the Core Set. In addition to the card's availability in the Core Set, two copies are included in the Brynjolf's Heist theme deck, and one copy in the Hlaalu Schemes theme deck. "There are ill winds this day." "My claws greet your throat!" This card was previously part of the training mechanic where it could be upgraded from Dune Rogue at level 21. This card's ability applies the Ill-Gotten Gains card effect. 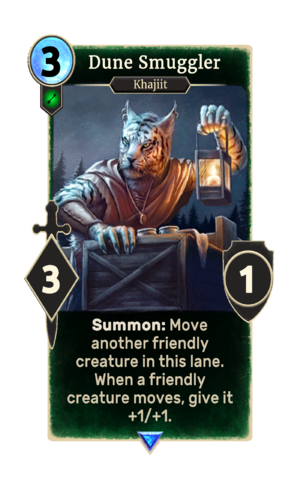 Prior to January 2017, this card would move any friendly creature. This was changed because it could render an opponent's cards ineffective while concentrating power in one lane. The card is named for the Elsweyr city of Dune, which first appeared in Arena, and later reappeared in ESO. This page was last modified on 14 February 2019, at 11:17.